Looking back over the year is a profitable exercise for me personally because I forget so much and so quickly. Perhaps it is the volume of information coming from all corners of the globe that trains the mind to retain very little. A review of the posts here over the past year reminds us of recent history but it also allows us to judge what was more important and what was less. I have compiled several lists of “top stories.” Today we will review major discoveries, top technology-related stories, and losses. Tomorrow we will survey significant stories, noteworthy posts, and favorite resources of the year. These lists are subjective, and since they are based on what the authors of this blog decided to post (and not to ignore), they are doubly subjective. The primary criteria for inclusion here was that the story was posted on this blog and then it caught my eye when I reviewed the year’s stories. The lists follow a roughly chronological order. Tomorrow I will share my choices for most significant stories, noteworthy posts, and favorite resources. SourceFlix’s latest video shows a shepherd seeking out a lost sheep. Matthew Kalman has a summary of the recent dust-up between Amos Kloner and Simcha Jacobovici. The Israel Museum will be hosting an exhibition on King Herod next year. Shmuel Browns posts some of the earliest photos taken in the Holy Land. A court ruling will preserve antiquities near the Roman aqueduct in Caesarea. We now have a better understanding of the gruesome details of the murder of Ramses III. A five-minute clip of General Allenby in Jerusalem is online. For a longer version without the Hebrew annotations, see here. The Times of Israel is reporting that Muslim authorities moved tons of illegally excavated earth from the Temple Mount into a city dump. Aren Maeir posts an astounding video of a flood in the Harod Valley this week. Frankincense has returned to Israel after 1,500 years. More tourists visited Israel in 2012 than in any year before. An Israeli committee will review modern prohibitions against mixed prayer at the Western Wall. Jean Perrot died this week. Among other things, Perrot excavated several Chalcolithic sites near Beersheba. Marked down to $1.99 for Kindle: The Aleppo Codex: A True Story of Obsession, Faith, and the Pursuit of an Ancient Bible, by Matti Friedman. These sales are brief. Segregated prayer areas at Western Wall. Photo by Austen Dutton (source). Miriam Feinberg Vamosh writes about the biblical site of Aphek in Haaretz (free subscription required). The lumbering fortress that crowns the ancient mound at Yarkon Sources-Tel Afek National Park is just one of many must-see sights and a good place to start an approximately two-hour visit that effortlessly combines nature and heritage. From the northwestern tower of this 16th-century compound you’ll get a breathtaking view of the coastal plain. From the southeastern corner of the fortress you can peer down at remains of the Roman road, built by Herod the Great who named it Antipatris after his father. The road recalls the New Testament story of Paul the Apostle, who spent the night here with his Roman guards as they marched him from Jerusalem to Caesarea (Acts 23:31). But the road is a virtual historical toddler compared to the other antiquities you’ll see. The city of Afek, straddling a strategic pass on the ancient highway from Egypt to Mesopotamia (the Via Maris) was founded in the fifth millennium BCE and is first mentioned in Egyptian writings some 4,000 thousand years ago. Among the finds unearthed in excavations of the Egyptian governor’s palace are documents written in hieroglyphics, Hittite, Akkadian, and Sumerian. The story also notes the biblical connection as well as some modern history. The four-minute video does not include narration. For more photos and history of the site, see the BiblePlaces page on Aphek and Antipatris. Lake and Turkish fortress at biblical Aphek. Photo from the Pictorial Library of Bible Lands. The mystery began Dec. 12, when a package addressed to “Henry Walton Jones, Jr.” arrived at the University of Chicago Admissions Office. A student worker realized that the package was meant for Dr. Indiana Jones, the famous archaeologist of Raiders of the Lost Ark fame. Inside the package was a journal of Abner Ravenwood, the fictional UChicago professor who trained Indiana Jones. Six days after its arrival, the mystery was solved. The package, a collection of replica props from the Indiana Jones films, had been purchased online and shipped by its maker from Guam to Italy. The original packaging was lost in transit in Honolulu, Hawaii, leaving only the parcel addressed to Henry Walton Jones Jr. of the University of Chicago, which the postal service then forwarded. Paul Charfauros, who created the journal, donated it to the University of Chicago. Some suggest that two real-life pioneering scholars of the Oriental Institute—James Henry Breasted and Robert John Braidwood—inspired the fictional characters of Abner Ravenwood and Indiana Jones. 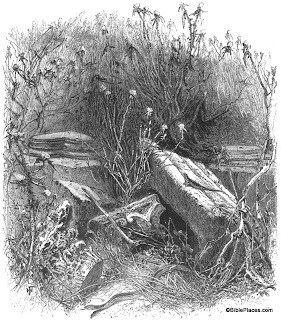 Unlike some Hollywood depictions of archaeologists, Breasted and Braidwood were not treasure hunters. The package and its contents will be on display in the lobby of the Oriental Institute Museum through March 2013. A Judean temple from the 10th-9th centuries BC has been discovered four miles northwest of ancient Jerusalem. The structure has massive walls, faces east, and contained a cache of sacred vessels. The site of Tel Motza may be the town of Mozah mentioned in the city list of Joshua 18:26 and some believe the Emmaus mentioned in Luke 24 was located nearby. Location of Moza in relation to Jerusalem. Archaeologists have dated the building to the Iron Age IIA, a period dated by most scholars to 980–830 BC, contemporary with the reigns of Solomon, Rehoboam, Asa, and Jehoshaphat. Each of these kings was faulted for not “destroying the high places” (1 Kgs 11:7; 14:23; 15:14; 22:43). Few such illicit worship sites are known from the land of Israel; the best preserved ones were excavated at Dan and Arad. According to Anna Eirikh, Dr. Hamoudi Khalaily and Shua Kisilevitz, directors of the excavation on behalf of the Israel Antiquities Authority, "The ritual building at Tel Motza is an unusual and striking find, in light of the fact that there are hardly any remains of ritual buildings of the period in Judaea at the time of the First Temple. The uniqueness of the structure is even more remarkable because of the vicinity of the site's proximity to the capital city of Jerusalem, which acted as the Kingdom's main sacred center at the time." The site was excavated as part of road construction works on Highway 1, the Tel Aviv-Jerusalem road. The press release of the Israel Antiquities Authority is here and six high-resolution photos are available from this link. The story is reported by the Jerusalem Post, Arutz-7, and other sites. Aerial view of excavation site. Photograph: Skyview, courtesy of the Israel Antiquities Authority. Figurines of bearded men. Photograph: Clara Amit, courtesy of the Israel Antiquities Authority. Figurine of horse. Photograph: Clara Amit, courtesy of the Israel Antiquities Authority. Religion News Service has begun a few feature called “Ask the Experts” and the first edition is focused on Christmas. They ask half a dozen scholars to weigh in on the following questions. I provide responses to three questions. Why do some Christians celebrate Christmas on January 7th? Why do we repeatedly hear about the “three wise men,” when biblical scholars tell us there were in fact many magi who attended Jesus after his birth? Why did Mary and Joseph have to go to Bethlehem? How did civil authorities determine which town people had to report to at census-taking time? Is it true that the word translated “inn” – kataluma – could also mean guest room? In other words, could Mary and Joseph been seeking shelter in relative’s guest rooms, rather than at the inn? How was the birth of Christ celebrated before Constantine? Is it true that most Christian churches did not celebrate Christmas in significant way until about a hundred years ago? Is it true that department stores were the ones that started many of the traditions that we celebrate today? The statement that Bethlehem was not on a major road is wrong. Bethlehem is located along the central ridge of the hill country and virtually everyone traveling to Jerusalem from the south would have passed by it. For more about the kataluma issue, see my previous post here. Read all of the questions and answers here. Shepherd with flock near Bethlehem. Photo from The American Colony Collection. This Jerusalem Post article suggests the Top 5 Christmas activities in Jerusalem. The traditional King David’s tomb has been vandalized by a man desperate to get married. If you missed last week’s Christmas broadcast of the Land and the Book radio program, you can listen to it in the archives. The Huffington Post has a slideshow of the year’s archaeological highlights. None are related to the biblical world. The full-size replica of Noah’s Ark floats. Smuggling gangs in Iraq are using satellites to locate antiquities. A view of David’s Tomb taken ca. 1900 before the construction of the Dormition Abbey. Photo from the American Colony and Eric Matson Collection. People often wonder how the Great Pyramids of Giza were built and how much work it took to construct them. But have you ever asked yourself, "How much work would it take to tear down the pyramids?" In the late twelfth century, some people tried to do just that. Volume 4 of Picturesque Palestine, Sinai and Egypt provides us with the story. The image below is entitled "Pyramids of Gizeh" and is one of the few steel engravings in this volume. 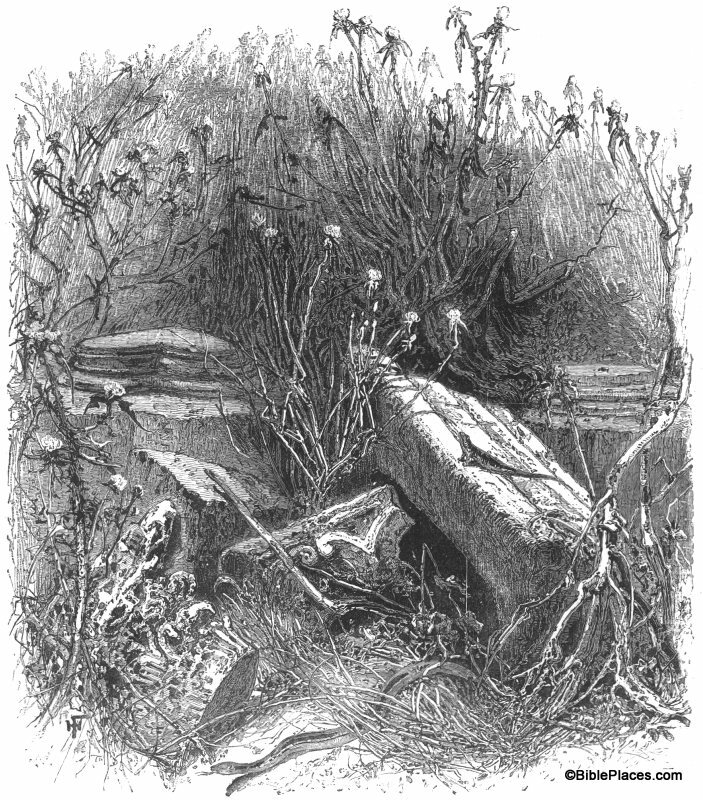 (The rest of the images are wood engravings.) In the section below, the author summarizes the work of a 13th century physician known as ’Abd-el-Latif of Baghdad. 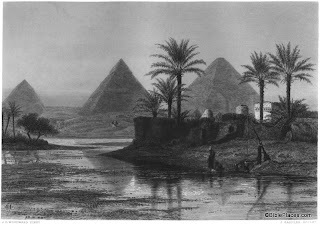 ’Abd-el-Latif visited Egypt and wrote of his experiences there. In 1196, the governing authorities decided to tear down one of the pyramids to provide raw material for a new construction project. Quote taken from Picturesque Palestine, Sinai and Egypt, vol. 4, pp. 170-173. 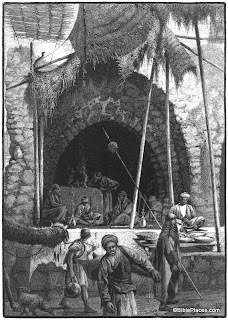 This and other images of nineteenth-century Egypt are available in Picturesque Palestine, Volume IV: Sinai and Egypt and can be purchased here. Additional images of the Giza Pyramids can be seen here and here. On the occasion of the 65th anniversary of the discovery of the Dead Sea Scrolls, the Israel Antiquities Authority and Google are pleased to launch today the Leon Levy Dead Sea Scrolls Digital Library website, www.deadseascrolls.org.il. The public is invited to experience, view, examine, and explore this collection of over 5000 images of Dead Sea Scrolls, in a quality never seen before. Shuka Dorfman, Director of the Israel Antiquities Authority, said: "Only five conservators worldwide are authorized to handle the Dead Sea Scrolls. Now, everyone can "touch" the scrolls on-screen around the globe, and view them in spectacular quality, equivalent to the original! On the occasion of the 65th anniversary of their discovery, the IAA, in collaboration with Google, presents the scrolls online, using the most advanced imaging technology. Thus, this most important national treasure is available to the general public, preserving it for future generations." This project was first announced in October 2010. Many news stories can be found here. This really is a fantastic resource and I hope they will expand it to include every scroll fragment. 4QDana includes portions from Daniel chapters 1, 2, 3, 4, 5, 6, 7, 10, and 11. Image from the Leon Levy Dead Sea Scrolls Digital Library. For the past 3,000 years, Jewish families have been bringing their dead to the Mount of Olives cemetery. A maze of hillside tombs, this graveyard is the holiest place for those in the Jewish faith to be laid to rest. Many Jews believe that when the Messiah comes to Earth riding on a white donkey, the dead will rise from their graves and walk to the holy Temple Mount in Jerusalem’s Old City. From the Mount of Olives cemetery, that’s only a few hundred metres. “Everyone in that cemetery is buried with their feet facing the Temple Mount so they come straight up and don’t even have to turn around. No one is going to get confused on the walk,” said Ira Rappaport, 67, who moved from New York to Israel 41 years ago and whose parents are buried in the cemetery. Authorities have identified more than 150,000 burials here — the cemetery has been used for more than 3,000 years so there are surely other undiscovered plots — but administrators say new plots are becoming scarce. In as few as 10 years, there will be no room for new graves, said Chananya Shachor, manager of the Jerusalem Burial Society, the largest of 13 societies that arrange funerals. The rest of the article gives some more history and gives the price of a plot. It is interesting that the author connects the resurrection with Zechariah 9 and the Messiah on the donkey and not Zechariah 14 where the Lord lands on the Mount of Olives to save Jerusalem. Cemetery on the Mount of Olives. Most of the settlement layers of Tel Afula were destroyed by construction activity in the 1950s, but a recent salvage dig found remains from the Early Bronze I and Roman period. Archaeologists working in the Ir Gannim neighborhood of Jerusalem excavated a winepress possibly first used in the Iron Age II and again in the Hasmonean period. A large storage pool was built here in the first century AD. A preliminary report from the 2011 season at Horbat Huqoq describes the project’s goals (synagogue and 2-3 houses) and reports on the initial progress including the excavation of a mikveh. This report does not describe the beautiful mosaic floor depicting Samson that was found in the 2012 season. Excavations near a site that Charles Wilson incorrectly thought was Capernaum have exposed three strata from the 13th-14th centuries. The dig at Huqoq Beach is 80 meters east of the entrance to the Khirbet el-Minya Umayyad palace. Excavations on the east side of the Mount of Olives were prompted by the chance discovery of a relatively rare Armenian mosaic from the Byzantine period. Two adjacent quarries were excavated in Beit Hanina north of Jerusalem. They provided Jerusalem with maleke limestone from the time of Jesus until modern day. Quarry K in Beit Hanina, looking north. Photo by IAA. The Herodium—A Monument to…whose sovereignty? Wayne Stiles provides a surprising twist on this one. “The greatest church in the world” has been undergoing excavation since 2006 and I had no idea. Amihai Mazar and Emanuel Tov were among a group of scientists inducted into the Israel Academy of the Sciences and Humanities this week. The newest issue of Biblical Archaeology Review is the first to carry a photo of the Samson mosaic showing the fox tails on fire. I am disappointed that Samson himself was not preserved. You’ll need a subscription to either the print or digital version to see the photo. For the original press release, see here. New book: The Photographs of the American Palestine Exploration Society, by Rachel Hallote, Felicity Cobbing, and Jeffrey B. Spurr. “This volume includes over 150 never previously published photographs of archaeological sites in the Middle East (Jordan, Lebanon, Syria, and Israel) taken in 1875 by photographer Tancrede Dumas for the American Palestine Exploration Society.” 368 pages, $90. The Dead Sea Scrolls and the Bible exhibit at Southwestern Seminary in Fort Worth closes in one month. If you have the opportunity, I highly recommend it (and I challenge you to find the large Jerusalem photograph printed in mirror image). Groupon has a 2-for-1 deal, but you’ll have to act fast as these sold out before I could mention it last time. Renovation of building over the location of the Antonia Fortress. Photo by Alexander Schick. If you’ve ever wondered which way Joseph and Mary traveled to Bethlehem or how the Magi were able to flee without Herod chasing, you should listen in tomorrow to the broadcast of The Land and the Book. Hosts Charlie Dyer and Jon Gauger interview me on the background of the familiar Christmas story. It's beginning to look a lot like Christmas...or so goes the song! From the music on the radio to the decorations in store windows, it's hard to miss the fact that Christmas is almost here. But what would it have been like for Mary and Joseph that very first Christmas? If we could somehow go back in time, what would the sights, sounds and smells of that first Christmas season have been like? We don't have a time machine here on The Land and the Book, but we have the next best thing…someone who has lived in the land of Israel and who knows it like the back of his own hand. We'll be talking with Todd Bolen about what it would have been like for Mary and Joseph that first Christmas season. You can find more details and a link for listening live on the Moody Radio website. If you're a pilgrim in Israel interested in Christian history, consider devoting a chunk of your visit to the Jesus Trail, an approximately 60-kilometer trail that begins in the northern city of Nazareth and ends at the shores of the Sea of Galilee. The trail allows hikers to follow the landmark sites of the Galilee Ministry of Jesus as the ancients did – on foot. Traversing the classic Jesus Trail takes four days, although that can be extended to five for walkers with less stamina. Additional sites can also be added farther afield, such as Mount Tabor, the site of the transfiguration of Jesus. 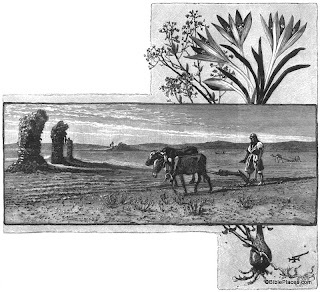 “As they walked,” is a very common expression in ancient Jewish as well as Christian sources. People walked everywhere, and it wasn't just the destination that mattered; so too did the journey. There was plenty of time on the way to talk about what mattered. The Jesus Trail was born out of a desire to get people to walk the Galilee just as in biblical times, taking in first and foremost all the highlights of the region’s New Testament sites and also enjoying Israel at eye level, at its multi-cultural best, where it overflows with history and natural beauty. The first day of the trail usually begins in Jesus's hometown of Nazareth and continues down to Sepphoris National Park, the main Roman city when Jesus was growing up. At the time, Sepphoris was the hub of Roman life. From here, trekkers continue on through the town of Meshed to Cana, where a beautiful church marks the traditional site where Jesus turned water into wine. Have you ever asked yourself, "How can I make my preaching and teaching come alive? How can I grab people's attention?" There are many ways to answer that question. Today we will look at one of them. One value of a work such as Picturesque Palestine, written and illustrated in the late 1800s, is how it shows Middle Eastern culture as it was before the modern era. Things changed slowly over the centuries and in many ways the Middle East seen by the early explorers was the Middle East of biblical times. That said, many of the drawings can be used effectively in preaching and teaching to transport the listener to biblical times and grab their attention. Due to the arrival of the digital age, modern western culture is highly visual, so Bible teachers and preachers should use this to their advantage. so stirring up anger produces strife." by him and cast his cloak upon him." "For the kingdom of heaven is like a master of a house who went out early in the morning to hire laborers for his vineyard. After agreeing with the laborers for a denarius a day, he sent them into his vineyard. And going out about the third hour he saw others standing idle in the marketplace, and to them he said, ‘You go into the vineyard too, and whatever is right I will give you.’"
It is often hard for people living in the modern era to get their head into the ancient world. Pictures such as these can go a long way to painting the correct picture. 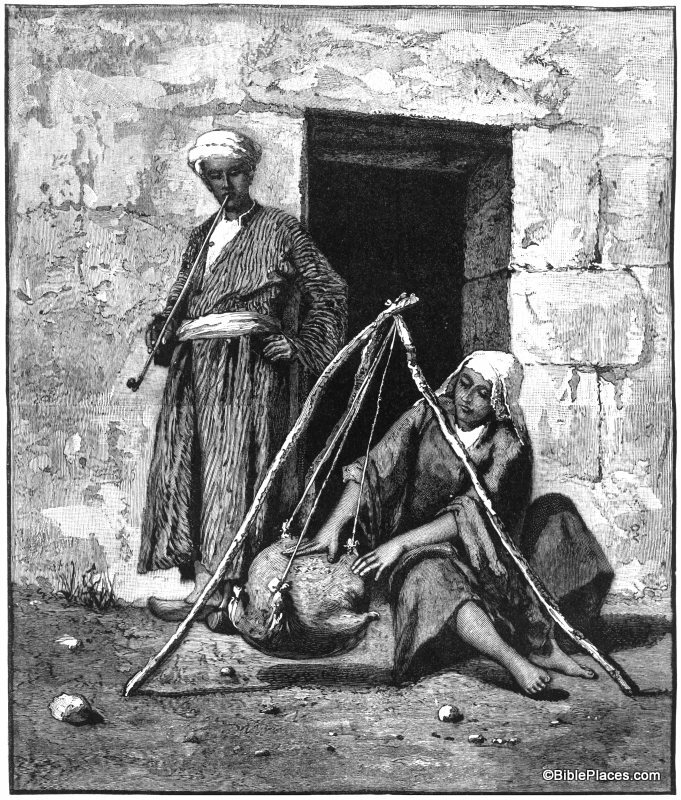 This and other images from the nineteenth-century are available in Picturesque Palestine, Volume III: Phoenicia, Philistia, and the South and can be purchased here. 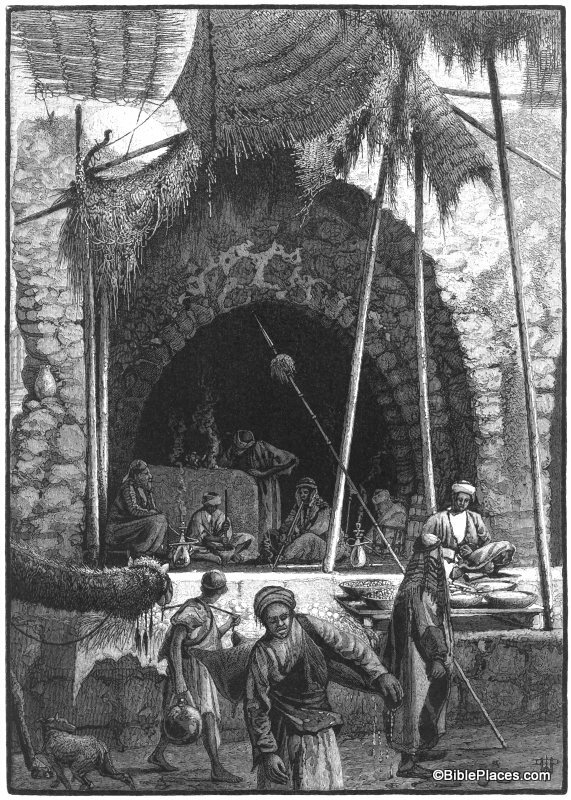 Additional images of domestic work performed by women can be seen here, images of agricultural work can be seen here, and images of the marketplace can bee seen here. Leen Ritmeyer has photos from Alexander Schick of a wooden version of the formerly Holyland Hotel model of Jerusalem, now on display at Ben Gurion Airport. Haaretz has a story about a Canaanite banquet hall discovered at Tel Kabri. The Samaritans are using genetic testing (and abortion) to reduce the chances of birth defects caused by inbreeding. The first snow of the season has fallen on Mount Hermon. Vandals have attacked the Monastery of the Cross in Jerusalem for the second time this year. You can now purchase the high-resolution artwork from the ESV Study Bible. The maps, illustrations, and charts/diagrams are available in packages for $10, or you can download everything for $25. Eisenbrauns has a 30-50% off sale on the 4 volumes of the Ashkelon reports. Model of Jerusalem at Ben Gurion Airport. Eisenbrauns has a one-day special on The Uttermost Part of the Earth: A Guide to Places in the Bible, written by Richard R. Losch. Until about mid-day tomorrow, the book is marked down from $16 to $1.60 (90% off). Richard Losch sets the stage with a brief history of the Holy Land from ancient times to the present. Writing clearly and vividly, he then offers alphabetically listed entries on dozens of locations found in the Old and New Testaments. He devotes considerable attention to the Roman Empire because of its prominence in the world of early Christianity. Also included are a number of places not specifically named in the Bible that nonetheless played significant roles in shaping biblical events. I not read the book but a few minutes of flipping through suggests that it is a generally reliable guide to about 75 sites and regions mentioned in the Old and New Testaments. Israeli archaeologists digging under a road in Jerusalem have uncovered the remains of an agricultural community that could yield new information on the lives of residents before and after the rise of the Hasmonean dynasty around 2,200 years ago, the Israel Antiquities Authority said Monday. The excavation in the city’s modern-day Kiryat Hayovel neighborhood has yielded a perfume bottle, wine press, bread oven and the remains of houses and agricultural buildings, according to an IAA statement. The community seems to have been active both before and after the Maccabees took Jerusalem and re-dedicated the Temple in 164 BCE, marking the beginning of Hasmonean rule, according to the IAA. That victory is commemorated this week by the festival of Hanukkah. The story continues here. Kiryat Hayovel is three miles southwest of the Old City. Excavations in Kiryat Hayovel. Photo by Israel Antiquities Authority. An agricultural complex one mile northeast of the Church of the Nativity of Bethlehem in Khirbet el-Qatt was in use during the Roman period and included cisterns, terrace walls, watchman’s huts, winepresses, olive presses, and a coin from the time of Herod. Some ancient pits excavated in Ramat Aviv in Tel Aviv had remains of mountain gazelle, dogs, and a donkey. A quarry of unknown date and sections of plastered wall and floors from a Byzantine monastery were excavated along Nablus Road north of the Old City of Jerusalem. Two squares were excavated on the western slope of Jonah’s hometown of Gath Hepher, revealing remains from the Early Bronze, Middle Bronze, and Iron II. If the excavators were a little more media-savvy, they could have made their fame and fortune showing off the cooking pot and jar that were certainly used by Jonah’s mother. Excavations on the edge of Tel Yafo (biblical Joppa) revealed lots of Iron Age pottery (the canteen Jonah dropped on his way to the boat?) as well as finds from the Hellenistic, Early Islamic, Crusader, and later periods. Vandals excavated a winepress in Horbat Pezaza but they left a second one untouched for those paid by the day rather than the piece. The archaeologists dated the winepresses to the Late Roman and Byzantine period. Winepress in Horbat Pezaza. Photo by IAA. The blog for Eilat Mazar’s excavations south of the Temple Mount has some new posts, including one reporting the discovery of a 10th-century Egyptian scarab. Mazar asks if the scarab belonged to Solomon’s wife. The largest Egyptian sarcophagus ever identified belonged to Merneptah and is now being re-assembled. Seth Rodriquez continues his biblical geography series with the Coastal Plain – Plain of Dor. SourceFlix records a funeral procession in front of the tomb of Lazarus and reflects on the meaning of Jesus’ miracle. Walking in the Dust of Rabbi Jesus is $2.99 on Kindle for a few days (recommended previously here). Glo is now available for $35 (reg. $90). Logos has several new Archaeology sets available at a discount. All of them include the standard surveys by Mazar and Stern. The medium size includes the “Cities of Paul” images volume. Site identification can be tricky business. Just because a Bible atlas or a scholar says that site X was once the ancient city of Y, doesn't mean that you have to believe him. Let's look at an historical example. Look familiar? Chances are that if you have visited Israel, you have been here. But today we don't call it Tell Hum ... we call it Capernaum. What Dr. Merrill says about the date of the synagogue is correct. The synagogue from the first century was most likely torn down and replaced with this beautiful building that later fell into ruin. But in the end it is a moot point and his other arguments have not withstood the test of time. 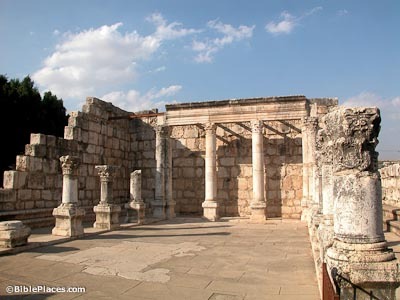 The general consensus today is that Tell Hum is the site of ancient Capernaum. It is true that we have come a long way since the nineteenth century explorers were doing their pioneering work. And yet, one has to wonder ... What site identifications do we hold to today that will cause people in the next century to chuckle and shake their heads at our ignorance? I guess that's part of the appeal of archaeology. There are so many mysteries still left to unravel. 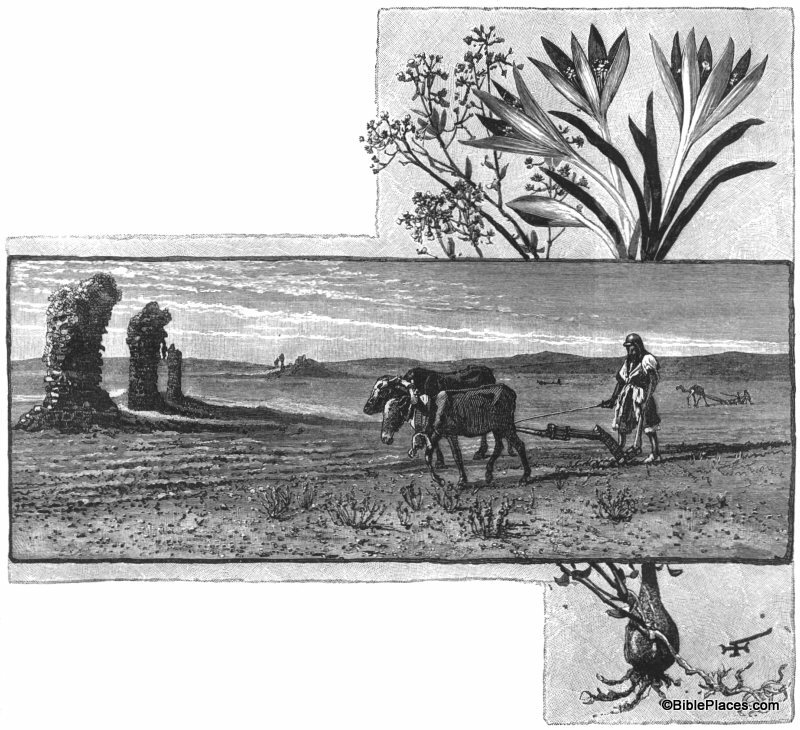 This and other pictures of nineteenth-century Galilee are available in Picturesque Palestine, Volume II: Samaria, Galilee, and Syria and can be purchased here. Additional historic images of the Capernaum can be seen here, and modern images of Capernaum can be found here. “Scattered throughout Israel are dozens of archeological exhibits, indoor and outdoor, that anyone can visit at no charge.” Aviva and Shmuel Bar-Am recommend three of those sites to visit. Iraqi authorities captured two smugglers in possession of rare statues and coins. The Dallas Museum of Art is sending one of its 2nd century mosaics to Turkey after determining that it was probably stolen years ago from the area of Edessa. The Jewish philanthropist who funded the excavation of the bust of Nefertiti was expunged from the records by the Nazis but is now being honored for his contributions. Shmuel Browns has opened a new online store for products with his photographs and artwork. El Al is offering reduced rates on winter flights to Israel. Charles Savelle on the new Pictorial Library of Bible Lands: If you teach the Bible, plan to go to the Bible lands, or have been there before, I would suggest you check this resource out. My favorite module is the BP American Colony. The ability to view photos which illustrate the way the land looked in Biblical times helps bring Bible study alive. Also, the historical views of Israel before modern technology and the founding of the nation are fascinating. This module is an excellent resource for teaching illustrations as well. I agree! The Accordance edition of this collection has a number of improvements over the original edition, and this is a great deal for a limited time. Archaeologists have uncovered what they believe is a road that was traveled by Jesus and the disciples in the ancient town of Bethsaida. In conducting a dig near the Northeastern shore of the Sea of Galilee in Israel, which was originally meant to serve as a mission to find artifacts from the Roman period, archaeologists came across a distinctive discovery. The article does not include a photo, and I don’t see any other reports on this besides this brief one. Newly discovered road ran from the “house of the fisherman” shown above toward the Jordan River. Photo from the Pictorial Library of Bible Lands. Archaeologists working at Acco have discovered harbor remains and four shipwrecks from the early 19th century. Deane Galbraith summarizes a new article in which Yigal Levin rejects the identification of Khirbet Qeiyafa as Shaaraim and proposes instead that it is the Israelite encampment. Bible History Daily has a short story on a new exhibit about Famous Americans Who Made Holy Land Tours. Featured tourists include Mark Twain, Herman Melville, and Theodore Roosevelt. The Muriel and Jeremy Josse Collection of Holy Land Maps includes more than 250 maps of late 19th- and early 20th-century Palestine and the African continent. Harvard University is returning to archaeology in Iraq after nearly a century, but they’re doing so without touching the ground. National Geographic has word (and photos) of the Oldest Pharaoh Rock Art Rediscovered in Egypt. Bible History Daily posts more than a dozen high-res images of “King David’s Tomb.” You need a subscription to read Jeffrey Zorn’s related article, but the images are available to all. And if you ever teach about the subject, you should grab the nicely colored drawings from Weill’s excavations while they’re available (below the photos). The city of Jerusalem has approved plans for rebuilding the second of two domed synagogues in the Old City. Both were destroyed in the 48 war, and the Hurvah Synagogue was rebuilt several years ago. A donation of $12 million is launching the rebuilding of the Tiferet Israel Synagogue. For a look at what’s going on in the broader world of biblical studies in the past month, head over to the Carnival.